Religion is not the first thing that comes to mind in college classrooms, let alone the field of global health. Mention of religion in the media and in the current presidential elections have forced it to have a negative connotation. However, discussion of different religious beliefs is necessary for students of all disciplines, especially those pursuing health-related careers, in order to understand how religion can play a role in the suffering as well as the celebration of cultures around the world. In short, religion is a significant factor underlying how individuals and communities access and practice health. With this in mind, GlobeMed at Northwestern discussed Islamophobia in a chapter meeting earlier this month. One GlobeMed member, Sarah Khan, is taking a step further and actively working to educate the campus community on Islam and how it relates to students today. Khan is a sophomore studying pre-med and is the Treasurer of Muslim-cultural Students Association (McSA), the group hosting Discover Islam Week from Feb 15 to 19 at Northwestern University. She answered a few questions about what DIW is, and how it relates to her and other college students. 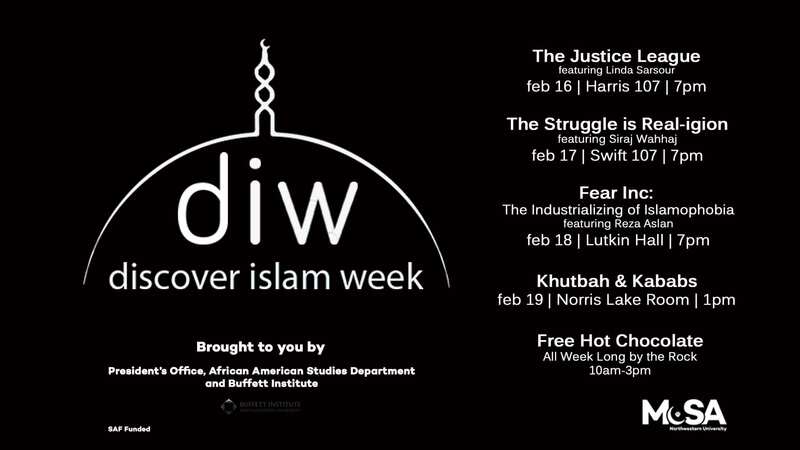 What is Discover Islam Week (DIW)? McSA’s annual Discover Islam Week (DIW) aims to raise awareness about both Islam and the Muslim community at Northwestern during Winter Quarter. During DIW, our organization puts on firesides, speaker events, and workshops aimed at educating the Northwestern community about Islamic faith and culture. Historically, these events have revolved around areas such as spirituality, current affairs, and community building. The week’s events really bring the Muslim community on campus together to advocate and spread Islamic awareness. Why did you get involved in DIW? I chose to get involved with this organization and DIW to spread the most knowledge and understanding of Islam I can to those around me. McSA has given me a family to lean back on, during a time where my beliefs and values are constantly questioned. The community it provides for Muslims on campus is truly remarkable and welcoming to all who wish to learn and participate. At a time when Muslims are being openly discriminated against in the news, in politics, in schools, and in the media – it is very necessary for us, and our relative academic institutions, to step up and advocate peace, unity and inclusion. What do you hope students get out of the DIW events, whether they are Muslim or not? I really hope students begin to disassociate the words “Muslim”, “Islam”, and “Arab” with the negative connotations and images the media and politics have been framing. I hope students get the opportunity to not just listen to what Islam is, but understand and learn from similarities and differences. Most importantly, I hope students realize that the Muslims who are fleeing war torn countries are in fact families. They are fathers, mothers, and children; just like you and me. The further dehumanization of Muslims around the world can lead to the downfall of standards of civilized society. We hope that McSA’s small acts of advocacy can help in connecting the hearts and minds of some Americans to those who are being persecuted, but it also relies on the average student to make a choice to come to events to learn and be challenged, or to stay complacent. How does DIW relate to your involvement in GlobeMed or your health-oriented career? Personally, I feel compelled to lead a health-orientated career because of my faith. Providing equitable healthcare to the impoverished and underprivileged communities in need aligns closely to the basic tenets of my Islamic values. The empathetic and compassionate foundations of Islam are commonly ignored, and DIW aims to promote these values to the larger Northwestern body. Being a part of GlobeMed, I am actively thinking about the populations in need of service and what we, as university students, can do.